big smile to your face. protective box. Box is roomy enough for your veil too. Box size: 32-1/2" x 21-3/4" x 8-5/8"
Box, nor Pick Up & Delivery Gown. and an individual shipping box. 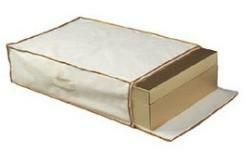 Box size: 27-1/2" x 19-1/2" x 7-1/4"
In store Gown Cleaning & Preserve only. fit in this box too. Box size: 18" x 12" x 3-1/2"
Sorry, we no longer ship Gown Box, nor Pick Up & Delivery Gown. carry handle. This bag ONLY fits the Premium Box, Keepsafe. 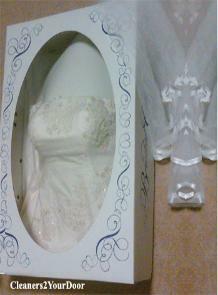 storage containers to keep your gown in pristine condition. gaze at your preserved treasure on your own, twirling through time to that splendid day. Before storing any gown or dress, make sure they are CLEAN! 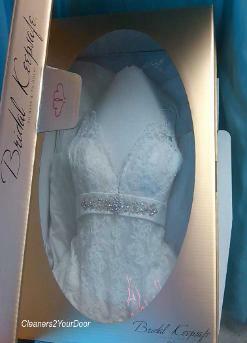 How To Fold Bridal Gown for Preservation Box. Insert Burst Form to fill out the bodice. Line the box bottom with tissue paper. front edge of the box. they fit nicely in the box. Put sheet of tissues between the folds to pad them. stuff them as well and place nicely around bodice. Be creative! Now put on the crystal clear oval viewing window and admire your breathtaking gown!